1: Irvinder Singh Babra (Brampton, Ontario, Canada), March 21, 2010, 7:20 AM. He was all these things you captured here, Michele, poetically. I was at his funeral, have some great photos ... a good man, the kind that there are very few of these days. 2: Gurmeet Kaur (Atlanta, Georgia, U.S.A.), March 21, 2010, 8:51 AM. Oh, Michele Kaur! How blessed are you to receive these gifts that are out there but most of us close our minds and hearts to. Thank for teaching us to open ourselves to receiving. 3: Sangat Singh (Kuala Lumpur, Malaysia), March 21, 2010, 4:45 PM. 'Pitaji' - I never had the good fortune to meet this benign, meditative and kindly Pitaji, unlike those lucky to touch his hem in America or Canada where he had reached as ordained. "Nak nath khasam hath kirat dhakay daey/ jahaa daanay tahaan khaanay naaka sach hey". I had my own 'Pitaji' and, like most, did not recognize his greatness fully until he was gone, to my utter remorse that I should have sat at his feet and served him. He would do complete 'sehaj paatth' almost weekly. He had a beautiful resonant voice and routinely sang at least 10 - 15 shabads within earshot of our neighbours. If by perchance they didn't hear him, they would call to ask, 'Is Bhaiyya-ji all right?" Soon after partition, we settled in Ludhiana (Punjab), almost penniless, but never missed a meal. Every morning, 'Bhaiyya-ji' would do 'ardas' and we kids had to stand behind him as was the unspoken order. I used to feel the aura of a strong magnetic field, and a distinct feeling that no harm shall come to us. I also had the feeling as if all the forces of the world are also standing behind him with folded hands and ready to protect us despite the loss of material wealth. We were in chardi kalaa and don't remember a single day when we went without a meal. Such was his faith. He passed away in the mid-60s in Kanpur (India) without any marked illness. My elder sisters were around him reciting Sukhmani Sahib. When they reached the 24th ashtpadi, he folded his hands and said "Hun challiye" - 'Shall I go now?' For me personally, I wish to share a lesson that I had learned unasked. In 1952, there was this film 'Anarkali' playing. It was the last show and my 'chandal chaukri' ordered that it was mandatory that I had to see and literally abducted me to the 3rd last show that finished around 01:30 am. By the time I reached home around 2:00am and as I was climbing the stairs, I heard my Bhaiyya-ji's voice - "Satnam Waheguru", "Dhan Guru Nanak". It was time for him to get up as was his wont to start with the nitnem. I just sat frozen on the stairs, and as soon as he went to the bathroom, I slipped into the bed fully dressed as if I had not gone anywhere. That was it; never again shall I do this sort of thing, and kept my promise ... and have never been to any late shows upto this day. Such was my Pitaji or Bhaiyya-ji, as we fondly called him. 4: Bob Williams (Guelph, Ontario, Canada), March 23, 2010, 12:41 PM. 5: Surjit Singh Kalra (Pleasanton, California, USA), June 20, 2016, 6:02 PM. Bhayyia ji - my Naana ji - I remember him all the time. 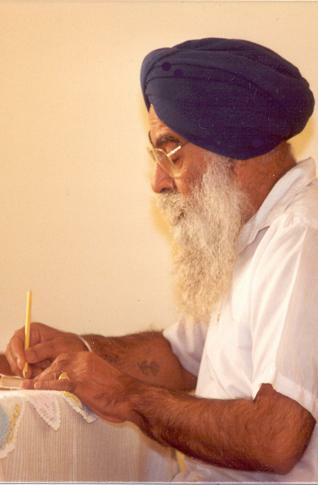 His singing a shabad with his full voice, crystal clear, in high notes, and early morning nitnem, sitting between all his grand-children during our summer vacation. I learnt Chaupai Sahib and Sawaiyye at a very young age just listening to him early in the morning. Comment on "Once I Met Pitaji"